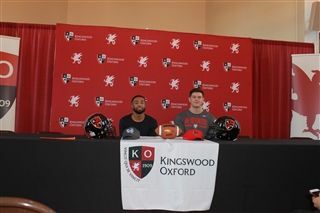 Kingswood Oxford football standouts Ethan Miner ‘19 and Kyren Petteway ‘19 made their college choices official on Tuesday at a signing ceremony on campus. Miner, the NEPSAC Class C Lineman of the Year, signed with Arkansas State while Petteway, a two-time All-New England selection, committed to Central Connecticut State University. Miner made the most of his two seasons at Kingswood Oxford, earning First Team All-New England honors as both a junior and a senior. This past season Ethan helped lead the Wyverns back to a NEPSAC Bowl Game and was named the Lineman of the Year Award for the Evergreen League and he also earned the overall Lineman of the Year Award for the entire NEPSAC C Division. Miner played in the Connecticut-Rhode Island All-Star Game. Petteway is a threat to score any time he is on the field and that includes offense, defense and special teams. A two-time First Team All-New England selection, Petteway scored six touchdowns in a game during his junior season, scoring touchdowns four different ways in the process. Petteway is joining a CCSU program that is on the upswing. The Blue Devils won the 2017 Northeast Conference (NEC) title and advanced to the the NCAA FCS Playoffs. This past season, Central Connecticut played for its second straight title in the final week of the season before dropping a 38-31 decision to league champion Duquesne.